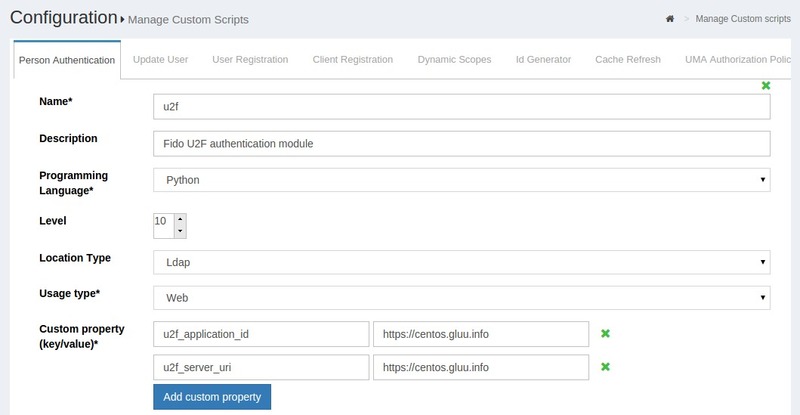 Interception scripts enable you to customize many aspects of your Gluu Server identity and access management service. This tutorial explains how to write an authentication interception script to implement a two-step out-of-band authentication using Twilio to send an SMS with a one-time password. At the end of this tutorial you should have a better understanding of how to write your own custom scripts. 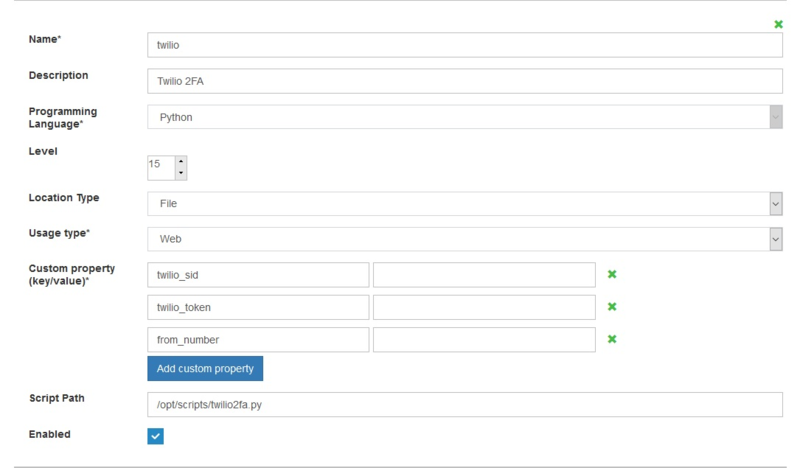 For reference, you can review the completed Twilio custom authentication script here. !!! Warning: Be aware that while testing authentication scripts you may lock yourself out of web the UI. It's always advised to test authentication scripts in a separate incognito browser. If you do find yourself locked out, follow these steps to revert the authentication method. Gluu Server custom scripts are written in Jython. We recommended using Eclipse for coding purposes. 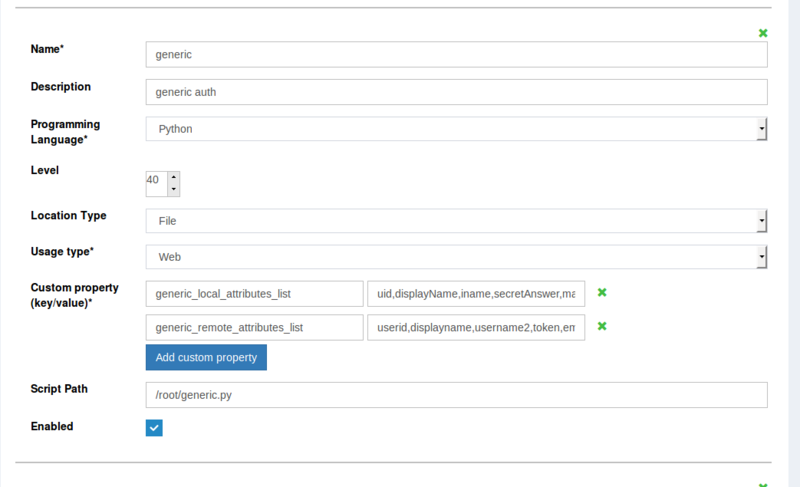 Configuration > Manage Custom Scripts > Person Authentication. Location Type The script can be stored in a "File" or in "LDAP"
Script Script Box will be displayed when Location Type is selected as "LDAP"
One or more XML files (you'll need one for each XHTML file) that provide information to the web server about how to display the XHTML file. There are many good examples of authentication interception scripts in Gluu's oxAuth integrations folder. The respective XHTML and XML files are checked into the auth folder. The interfaces for authentication interception scripts can be found in the Gluu Documentation. We used the Basic Script as a template. The Wikid forms were also used as a template since it requires that we pass the value of the code obtained from Twilio to step 2 of the authentication to validate and authenticate the user. The Wikid authentication script was also looked upon for examples on how to process the form. After the custom script is added, navigate to Configuration > Manage Authenticaion > Default Authentication Method and change the oxTrust authentication mode to "Twilio" (or the custom name of your script). ACCOUNT_SID - Numerical sequence of numbers, to identify the token assigned to the user associated with Twilio. AUTH TOKEN - Alphanumerical number provided by Twilio for the account holder to identify the user. FROM_NUMBER - Number which is either assigned by Twilio or can be a number user provides to send the code from. The most important method to implement is the authenticate method. This is where the main business logic is located for the authentication workflow. It is possible to switch on the step, with the if (step == 1): statement. In oxAuth, there is no assumption that step 1 and step 2 happen on the same server, therefore the value is stored in LDAP using a temporarily created attribute that can be retrieved in step 2. The step is sent to the authenticate method, which helps to save and retrieve the values as required. random.randit("start number",""end number") Generates the code as required. This particular method is obtained from jboss to pass the session attribute value to LDAP by creating a temporary attribute which has a limited lifetime and can be retrieved within the life span, otherwise it expires and the session becomes invalid. Save the value of the code obtained through the code generator method. context.set("Name of the temp attribute", <key>) where <key> is the value that needs to be stored temporarily in ldap. To access information from requestParameters in your script with ServerUtil.getFirstValue(requestParameters, <key>) where <key> specifies the value you want to retrieve, you can also use another method requestParameters.get("<key>") where <key> specifies the value you want to retrieve . 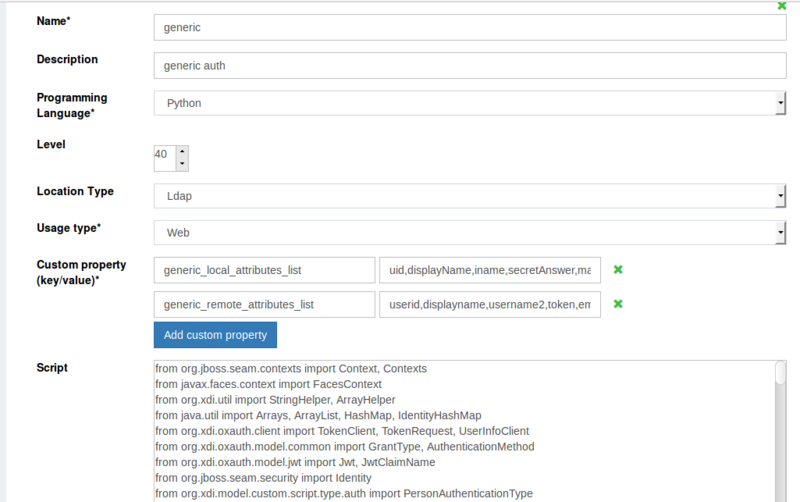 getUserByAttribute("LDAP Attribute", <key>) method accesses information in LDAP and retrieves the value of the attribute comparing the value of the <Key>. To retrieve the value of an attribute from LDAP, getAttribute("LDAP Attribute name") can be used. requestParameters.get(<key>) can be used to retrieve values passed from the form through the headers. This will retrieve the values from the form via header and can be stored in a string. Where <key> is the value to be retrieved from header. Another method usually needed to implement is getCountAuthenticationSteps. This method normally just returns 1, 2, or 3. If implementing an adaptive authentication strategy, where the number of steps depends on the context. Check the Duo script for a good example of how getCountAuthenticationSteps can be used to implement adaptive authentication. The Duo script is scripted so that two-factor authentication is only presented for users in the IT group. The script checks for group membership and dynamically adjusts the number of steps. This can be implemented to check for any logic or attribute during the authentication, like "country" or "region". If required to save session variables between steps, use the getExtraParametersForStep method. The Gluu Server persists these variables in LDAP in able to support stateless, clustered two-step authentications. If required to display a special Web page for an interactive login, or even a custom first page, you'll need to implement the getPageForStep method to specify the page you want to return for a given step. The attribute value that are saved by the session using context.set. This method is derived from the oxauth core java libraries and called using the SessionState parameters which is defined in the code or program as session_attributes.get(<key>), where <key> is the session atribute value that is stored in the ldap. Logout(): The method for logout is already written in the code, this method could be further used as per the requirements. Its purpose mostly the same, beside the fact that each auth script's function will only be called for users whose authentication during login attempt was handled by corresponding script, but scripts of "Application session" type will be called every time during logout of each user, regardless of what method of authentication he used during login. context.set can be used to save values of the required key to an attribute temporarily and the created temporary attribute will be alive only for limited time and expires and gets removed, by that way, adding new attribute to the user is not messed up. And also the expired attribute kills the validity of the session and becomes invalid. Using session_attribute.get() method, stored session attribute can be retrieved anywhere between the authentication method, enabling values to be passed between multiple authentication methods for verification and validation. Generated code and the entered "code" in the form can be verified using a simple if and the "code" from the form can be obtained using the requestParameters.get() method or serviceUtil.getFirstValue() method. To access this information in your script with configurationAttributes.get("<key>").getValue2() where <key> specifies the value you want to retrieve. It is possible to use the Context to return a message to the user, which could be especially useful if an error occurs or some kind of user action is required. Pure Python libraries can be added to /opt/gluu/python/libs, and jar files can be added to /opt/gluu/jetty/oxauth/lib/ext. jar files should be added within chroot. When the scripting is done, you can test the script by printing the statments to oxtrust.log under /opt/gluu/jetty/identity/logs/oxtrust.log. Prefixing the logs will help to find the script using tail command tail -f | grep <prefix>, the prefix logs will provide the script output while one trys to login using the script. In the Twilio test script, a specific method called printOut has been scripted to make it easier to add this prefix. Also, remember that putting all the code in a try / catch is a good practice to avoid unhandled exceptions, since during debugging exceptions may provide a hint at what's causing the issue. Further logs to debug and monitor the sequence can be done using oxauth_script.log and oxauth.log under /opt/gluu/jetty/identity/logs/ which is within the chroot. It is not uncommon to get locked out of the Gluu Server while testing the authentication script.